Reverse engineering the Rebel Within: How to bake an egg with a runny yolk inside a bacon and cheese muffin. Cracked the code! And it wasn’t easy. The process to get there was really tedious, labour intensive and time consuming, but after all the trial and error there was a delicious result. Cooking shows always make things seem so effortless, and sometimes they are, but for the most part nobody is nailing it on the first try. Therefore I’m including all the behind the scenes footage and mess-ups to show you how we got here. I had originally approached Brenda (my recipe partner) to see if she was interested in figuring out how to make the infamous Rebel Within from Craftsman and Wolves in San Francisco. Luckily she was up for the challenge, and holy crap was it ever a challenge. This looks like a really intimidating recipe, but it really isn’t that bad once you know the answer… which we’re just giving to you anyway. There was a lot of trial and error, experiments, and explanations for the process. The following guest post and photos are by Brenda (@mightyvanilla). Note: If you’re vegan, vegetarian, gluten free, dairy free, or egg free… this is not for you. Alright, this is a really long post but there’s a recipe at the end of the tunnel. It began several months ago when Mijune had just returned home from San Francisco. 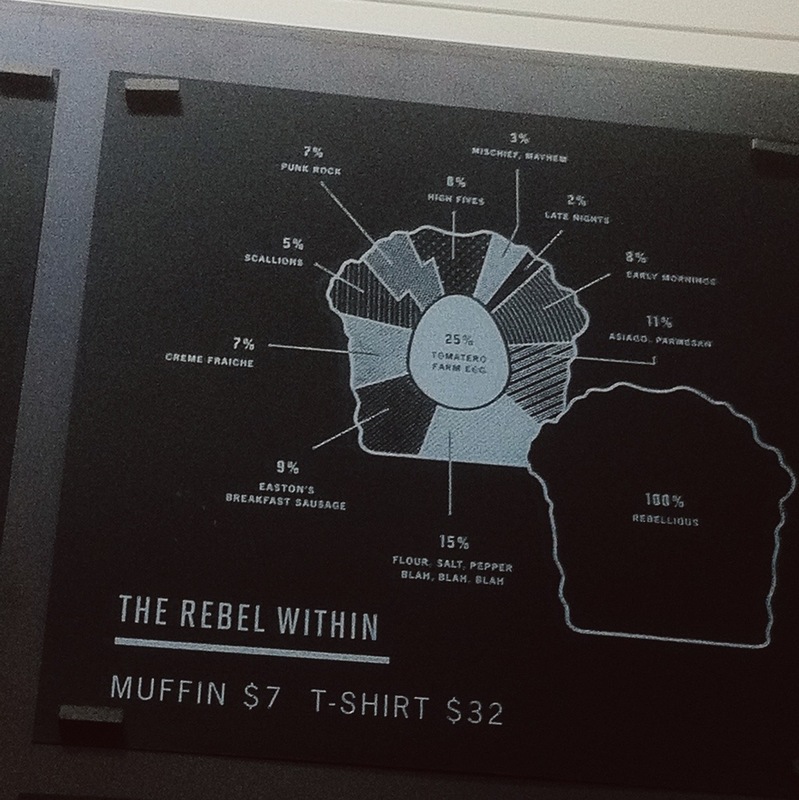 She had visited the Craftsman and Wolves bakery but didn’t get to try one of their signature items, a savoury breakfast muffin called the Rebel Within. This muffin has cult status and is made with asiago cheese, pork sausage, and green onion, and encases a runny soft boiled egg, like this. She wanted to try making something similar and asked if I’d be interested. A challenging baking project? Sold! We decided to try three different methods of cooking the eggs. The 5 minute boil was one of them, with the eggs starting in cold water. Sous vide seemed like the next natural technique to try and there were rumours that an immersion circulator was used for the original Rebel Within. An online Modernist Cuisine article had detailed information about the science behind egg cookery, plus a few recipes for sous vide eggs. It’s well known that an egg cooked sous vide in the mid-60 degrees Celsius range results in a runny yolk. Based on this, we chose a variation that called for starting the eggs in boiling water, boiling for 3 ½ minutes, cooling the egg in ice water, and finished sous vide at 64C for 35 minutes. This was the second test method. I also found some very informative articles on Serious Eats; one on the background and technique, and another on practical recipes. They had conducted many tests just using basic home equipment, and their post distilled the critical factors down to cooking time, water temperature, and water volume. Egg cookery is sensitive to many variables and I liked how they tested for the water temperature dropping when eggs were added to the pot. (Note: They found that 3 quarts is the minimum volume needed for maintaining a steady temperature when cooking 1 to 6 eggs.) For soft boiled yolks, the recipe page recommended cooking the eggs for 6 minutes in 82C water (180F) so this was our third test method. In the interests of expediting the muffin baking process, I cooked all of the eggs the day before and left them in their shells to cool overnight. I figured it would be better to bake the muffins with the eggs as cold as possible (in hindsight I think this still holds true), and the eggs would probably be too soft to hold their shape out of the shell (this turned out to be incorrect). I was also curious as to whether a soft boiled egg could be frozen before baking. This theoretically would be the coldest a yolk could get prior to being baked in the muffin. Many online sources said that this wouldn’t work as it would make the whites rubbery after thawing, though the yolk would still be fine. I didn’t find a source who had tried doing this with both peeled and unpeeled eggs so I decided to give it a shot using extra eggs that were cooked via the first method (cold water start, boil for 5 minutes). I peeled one but left the other in its shell, froze them solid, then thawed them. As you can see, neither results were good. The egg white in both eggs thawed into a strange rubbery texture. My guess is that a home freezer isn’t cold enough to freeze things fast enough to prevent the water from being squeezed out of the protein-rich egg white. (Think of the difference between home-frozen fish and fish that has been flash frozen at sea.) A blast freezer or liquid nitrogen on the other hand, hmm… but I digress. Back to the muffin testing. When it came time to peel the eggs from the three different cooking techniques, we ran into problems. The eggs that were started in cold water and then boiled for 5 minutes peeled the most easily. However, the eggs from the other two methods were very soft and kept sticking to their shells; they had to be boiled for an additional 2 minutes to get them firm enough to peel. (The Modernist article mentioned using a blowtorch or toaster oven to heat the eggshells. This should make them more brittle and easier to peel but it didn’t work. We used free range eggs from a small farm for this round of testing and in hindsight this was probably the reason; the eggshells were thicker and stronger than supermarket eggs.) We decided to go ahead and use the eggs as they were. For the baking pan, we used a large 6-cup popover mold (from Call the Kettle Black) because its high sides would support the soft boiled eggs as they baked. Each of the cups was approximately 150mL in volume. (Determined by measuring the amount of water it takes to fill one of the cups.) Since the mold made six muffins at a time, we baked two eggs for each of the three cooking methods. Eggs should be baked in molds with high sides. (The mold above was from Call the Kettle Black). The muffin batter itself was straightforward. We used a stand mixer to combine the dry ingredients together, then mixed in the wet ingredients, and finally the cheese and bacon. To keep the muffins consistent, I used an ice cream disher to place the same amount of batter in the bottom of each mold. An egg was placed on the scoop of batter, the remainder of the batter was placed in a piping bag, and then batter was piped into the molds and all around the exposed parts of the eggs. Lastly, the muffins were topped with some extra cheese before going into the oven. The muffins smelled great as the baked, and they rose high in their molds. After letting them cool for a bit, the moment of truth came. Cutting time…. Well, the egg results were disappointing to say the least. None of the yolks were runny and there was virtually no difference in the eggs from the three cooking methods. It’s difficult to tell in the picture but there were two different textures of egg white in each egg: a firm part that was cooked by the original method, and egg white that was uncooked or less cooked at the time it went into the oven. This was an interesting effect and it’s visible in some pictures of Craftsman and Wolves’ Rebel Within, albeit to a lesser extent. But overall the muffin was tasty and they were delicious for breakfast over the next few days. The texture was on the dense side but we had added a lot of cheese; this would be an easy thing to adjust in the next iteration. 1. Start eggs directly from the fridge and place into into 3L of cool water, bring to a boil, boil for 5 minutes, cool in an ice bath, cool in shell overnight. 2. Start eggs directly from the fridge and place into 3L of boiling water, boil for 3 ½ minutes, cool in an ice bath, sous vide in 3L of 64C water for 35 minutes, cool in shell overnight. b) Peeling: Difficult, egg was very soft. Had to boil for 2 additional minutes to get egg firm enough to peel. 3. Sous vide eggs straight from the fridge in 3L of 82C water for 6 minutes, cool in ice bath, cool in shell overnight. I decided to start with the simpler Saveur technique of gently cracking and peeling the eggs while they were still warm, starting at the wide end, and peeling them under running water. I also wanted to take a more careful look at the eggs themselves before putting them in a muffin. In order to keep the results comparable, I bought 3 dozen eggs of the same brand (Born 3), same size (large, ~63g in shell), and with the same expiry date. Saveur states that egg freshness makes a difference; older eggs peel more easily than fresh eggs. You can measure this by placing the egg in a glass of water: if the egg sits on its side, then it’s fresher. As it ages, the egg will start to sit more upright. About.com provides descriptions on how fresh or old an egg is depending on the angle it sits in the water. According to the water test, these eggs were about a week old. Supermarket eggs only have a best-by date and not a harvest date so there was no way to know how accurate this was. Still an interesting data point nonetheless. For the second round of egg tests, I wanted to determine how much of a difference starting the eggs in cold water versus boiling water made. The goal was to cook the eggs for the minimum amount needed in order to get a firm enough egg to peel, but I wasn’t sure how the cold water start affected the doneness of the yolk. As it turns out, it was a lot. All of the eggs in this round of testing went straight from the fridge into a pot with 3L of cool water, the water was brought up to a boil (which took just over 15 minutes on my gas stove), and then the eggs were kept in the boiling water for different amounts of time (4 minutes, 3 minutes, 2 minutes, 1 minute, 0 minutes). I followed Saveur’s peeling technique and between that and using supermarket eggs, the peeling was much easier than in the first round. However, this time I also cut into the eggs to check the yolk doneness; I didn’t want to go to the trouble of baking them in a muffin if they weren’t already runny to begin with. Unfortunately, it turns out that the 15 minutes it took for the cold water to come up to boiling had already cooked the yolks too far. The yolk in the 0 minute boiled egg had already set firm but with a sticky texture. The other eggs were cooked to even further degrees of yolk doneness so I didn’t bother baking them in muffins. Back to the drawing board (along with egg salad sandwiches for a few days). 1. Start eggs directly from the fridge and place into 3L of cool water, bring to a boil, boil for 4 minutes, cool slightly in an ice bath, crack and peel while still warm. 2. Same method as previous but boil for 3 minutes. 3. Same method as previous but boil for 2 minutes. 4. Same method as previous but boil for 1 minute. 5. Same method as previous but remove egg from water as soon as it reaches boiling. b) Peeling: Egg was starting to stick to the shell and I had to be careful not to crack the egg too hard or else the white would split and leak yolk. With the question of cold water versus boiling water clearly answered, I moved onto researching methods where eggs were placed directly into boiling water. Conventional wisdom says that cold eggs placed into boiling water have a tendency to crack. One way of mitigating this is to warm the eggs up before adding them to the boiling water. Another is to add salt to the boiling water so that the leaked whites in a cracked egg will set faster and ‘plug’ the crack. I decided to use both for good measure. For this round of testing, 3L of water was brought to a boiling point. While the pot of water was coming up to boiling, the eggs were placed in a bowl of warm tap water to take the chill off from the fridge. Once the pot of water reached the boiling point, 1 tsp of salt was added, then the eggs were added and kept in the boiling water for various amounts of time (2 minutes, 3 minutes, 4 minutes). The peeling method was the same as Egg Tests Round #2. I found that the 2 minute egg could not be peeled at all, it was way too soft to keep its shape. I got most of the 3 minute egg peeled, but the narrowest end broke off. The 4 minute egg was quite easy (relatively speaking) and I was able to get all of the shell off. Encouraged by the results, I did one more test at 3 minutes and 30 seconds and was able to peel that egg as well. I cut the 3 minute 30 second and the 4 minute eggs in half to check the yolk runniness. This time the results were much better. These two eggs are shown below along with a cold start 0 minute egg from Egg Tests Round #2 for comparison. As you can see from the picture, the 3 minute 30 second boiled egg had an outer ‘shell’ of fully cooked white, but the white at the top of the egg and the yolk were both still raw and completely runny. The 4 minute boiled egg had the same outer ‘shell’ of cooked white, but the white at the top of the egg had cooked to a wobbly opaqueness while the yolk was still raw and runny. These eggs were definitely promising enough to be baked. The second batch of muffin batter was primarily the same as the first recipe, but with less cheese and a slightly different mix of wet ingredients so that the baked texture would be lighter. (I didn’t want to change too many variables at once and this bake test was still about the eggs.) Uncut versions of the eggs shown above were baked in the muffin batter – we had high hopes for this batch. Success!! We had ourselves a baked runny egg! The inner white at the top of the 3 minute 30 second Round #3 boiled egg had baked to an opaque wobbliness, similar to the unbaked 4 minute Round #3 egg. The inner white at the top of the baked 4 minute Round #3 egg had cooked further still, but not to the same firmness as the hard boiled egg white ‘shell’; I liked this overall result the best so far. I was curious about why the egg whites had two distinct areas of doneness though. The Serious Eats article had briefly mentioned that egg whites are made up of several different types of proteins and each protein has a different cooking temperature. The most likely explanation for the two areas is that the heat had penetrated to different depths in the eggs, and that the temperature varied by depth. Temperature boundaries within the egg would result in the different doneness levels. I found a very scientifically oriented sous vide egg cooking article on Fresh Meals Solutions which goes into this in more detail. They also include some very cool and geeky charts from a scientific paper that shows the relationship between total cooking time, temperature, and resulting egg viscosity. If Egg Tests Round #3 had also failed, I would have gone back to sous vide testing armed with this new information. 1. Bring 3L of water to a boil, place eggs from the fridge into a bowl of warm tap water while the pot water comes up to a boil, add 1 tsp salt to the boiling water, boil eggs for 2 minutes, cool slightly in an ice bath, crack and peel while still warm. 2. Same method as previous but boil eggs for 3 minutes. 3. Same method as previous but boil eggs for 3 minutes 30 seconds. 4. Same method as previous but boil eggs for 4 minutes. With the runny egg problem solved, it was time to give some attention to the muffin batter and address the dense texture. The third iteration had less cheese than before, a reworking of the dry to liquid ingredients ratio, a reworking of the liquids and leaveners, and the addition of sliced green onions for colour. To minimize the chance of overworking the batter, this batch was mixed by hand instead of by stand mixer. I couldn’t resist the chance to do a few more egg tests though. This last (yes, last!) round was essentially an extension of Egg Tests Round #3: same method but longer cooking times (4 minutes to re-verify the previous results using a new batter recipe, 4 minutes 30 seconds, 5 minutes). By now I had learned that the egg needed to be cracked as gently as possible. Too hard and you risk cracking the fragile egg white and spilling the yolk. The peeling step cannot be rushed. Once again, unbaked versions of each egg were cut to check the yolk runniness. The 4 minute egg was consistent with its Egg Tests Round #3 counterpart (‘shell’ of cooked white, inner opaque and wobbly white, very runny yolk). The 4 minute 30 second egg had the ‘shell’ of cooked white, a more cooked inner white, a very small outer shell of cooked yolk, and a slightly thicker but still quite runny inner yolk. The 5 minute egg had a white that was almost fully cooked, with the small inner white that was just barely wobbly, a thicker outer shell of cooked yolk, and a thick-runny inner yolk. The technique of filling of the molds and the baking time remained the same for all three muffin batches, but the third batch of batter was noticeably lighter in texture and much easier to pipe. 1. Bring 3L of water to a boil, place eggs from the fridge in bowl of warm tap water while the pot water comes up to a boil, add 1 tsp salt to boiling water, boil eggs for 4 minutes, cool slightly in an ice bath, crack and peel while still warm. 2. Same method as previous but boil eggs for 4 minutes 30 seconds. 3. Same method as previous but boil eggs for 5 minutes. How to bake an egg with a runny yolk inside a bacon and cheese muffin. Note: Due to the thermal sensitivity of a runny egg yolk, your own results may vary depending on the size of the eggs, the boiling and cooling of eggs, the size and shape of the muffin mold, the oven itself, the overall baking time, etc. If you are keen on reproducing the runny egg effect, I recommend cooking a few extra eggs and boiling them for 4 minutes and 30 seconds at most. The most challenging part of the recipe is getting the eggs cleanly peeled without tears or cracks, and it may take a few tries to get the hang of it. Warming the eggs before boiling them decreases the temperature differential between the eggs and the boiling water. This helps to prevent the shells from cracking due to thermal shock once they’re in the water. Briefly shocking the boiled eggs in an ice bath drops their temperature quickly and stops them from cooking further. Gently tap the soft boiled egg all over, just enough to crack it but not hard enough to deform and split the outer shell of hard boiled egg white. If the egg white splits, the runny yolk will spill out. It’s easiest to start peeling the egg from the widest end due to the natural air pocket there. A warm egg is easier to peel than a cold one. A supermarket egg is easier to peel than a free range egg. Free range eggs have noticeably thicker shells and the membrane sticks more tightly to the cooked egg. Peeling an egg under a trickle of running water helps to separate the shell from the egg. The eggs can be soft boiled and peeled up to several days before making the muffins. Chilling the peeled eggs before baking the muffin keeps the egg yolk colder for longer as the muffin bakes. When making the muffin batter, warming the buttermilk prevents the melted butter from re-solidifying when the liquid ingredients are mixed together. Mix the muffin batter by hand until the ingredients are just combined. Over mixing may result in tough muffins or large holes once baked. Use a disposable piping bag to pipe the muffin batter around each egg. If you do not have a disposable piping bag (or a reusable piping bag with a ¾” round tip), a very sturdy ziploc freezer bag with all of the air squeezed out will also work. You will not be able to test the muffin for doneness by the usual poking methods so some trial and error may be involved. The tops of the muffins should be golden brown and the cheese melted into a crust. The muffin should be firm and spring back when lightly pressed. The cheese blend can be customized to your own preferences. Stronger tasting cheeses will stand out more in the muffin. More cheese can be added to the batter but too much will make it denser. The cheese topping can be increased to taste. The amount of bacon, caramelized shallots and green onions can be increased to taste. Place 3L of water in a large pot and bring to a full boil. While the pot of water is coming up to a boil, place the eggs in a small bowl of warm tap water with enough water to cover. In a large bowl, prepare an ice bath with very cold tap water and the ice cubes. If you are baking the muffins on another day, line the egg carton with plastic wrap. The peeled eggs will go back into the carton and be refrigerated until ready to use. Set a timer for 4 to 5 minutes (depending on whether you want the final baked eggs to be runnier or less runny) but do not start it yet. Once the pot of water is boiling, add the salt. Gently but quickly lower the eggs into the water with a large spoon and place them on the bottom of the pot. Start the timer once all of the eggs are in the boiling water. When the eggs have boiled for the allotted time, transfer them immediately to the ice bath. Move the bowl of ice-bathed eggs to the kitchen sink. As soon as the eggs are cool enough to handle but still very warm, remove them from the ice water. Gently tap each egg on the kitchen counter, at the top and bottom ends of the egg, and then a few taps all around the sides. Be sure to gently tap around the tip of the narrow end to make more small cracks; this is the trickiest section to peel. Do not use too much force or else the cooked egg white will split open. Leave the cracked eggs out of the water for the time being. Once all of the eggs are cracked, peel each egg under a thin stream of cool running water. Hold the egg vertically in one hand with widest end of the egg facing upwards and start peeling from the cracks in the wide end. Be sure to peel off the thin membrane as well, then work your way gently around the egg in a spiral. Carefully pry the tip of your index finger under the eggshell as you go to separate it from the egg. The trickiest section to peel is at the last third, where the narrowest part of the egg is. Be very careful here when separating the white from the shell. If the white sticks to the shell in one spot, try to peel from a different spot. Place the eggs back into the ice water once they’re peeled. When all of the eggs are peeled, remove them from the water and gently blot them dry with a paper towel or lint free tea towel. Place the eggs back into plastic-lined carton, cover with additional plastic wrap, and refrigerate until they’re thoroughly chilled (at least several hours or overnight). Reserve approximately 25% of each type of cheese for the muffin tops. To dice the bacon, stack several strips of together at a time and cut them lengthwise, then cut the narrow strips into pieces approximately ½” wide. Start the oven heating to 400F and place the baking rack in the middle of the oven. Heat a non-stick pan over medium high heat and fry the bacon pieces until crisp. Remove the bacon from the pan and drain them on paper towels. Remove all but 2 tsp bacon fat from the pan. Cook the shallots or onions in the bacon fat over medium heat until they are light brown in colour and caramelized, stirring every minute or so. Remove the pan from the heat and allow the shallots to cool. Grease the insides of a large 6-muffin or popover mold with tall sides, where each cup is approximately 150mL in volume or slightly larger. In large mixing bowl, stir the flour, salt, pepper, baking powder, baking soda, and (optional) cayenne pepper together so that everything is evenly distributed in the flour. If the buttermilk is fridge-cold, warm it in the microwave for 20-30 seconds. In a medium mixing bowl, whisk together the eggs, the warmed buttermilk, and the melted butter until combined. Pour the liquid mixture into the dry mixture, and stir using a rubber spatula until the ingredients are mostly combined. Do not overmix; there should be a few clumps of flour that are still visible. Add 75% of the parmesan, 75% of the gruyere, and 75% of the cheddar to the bowl. Add all of the bacon, green onions, and shallots and stir until they are just combined with the rest of the batter. It’s okay if there are clumps of cheese visible. Using a 1oz ice cream disher or a large spoon, scoop ~2 Tbsp of batter into the bottom of each muffin mold. Use a small spoon to press the batter into the bottom of each cup and to make a small depression in the middle of the batter. Place a soft boiled egg upright into each depression. Scrape the rest of the muffin batter into a disposable piping bag and tightly twist the top. Cut the tip of the bag off to at least ¾” wide so that the bacon bits won’t get clogged in the hole. Pipe the batter around each egg in a spiral pattern, filling the rest of the cup and completely covering the egg. Be a little more generous at the top because the batter will slide off a little as it bakes and you do not want the top of the egg to become exposed. Add the remaining cheese to the top of the muffins. Bake the muffins for 17 minutes, rotating approximately halfway through the baking time. The tops of the muffins should be golden brown, and the cheese melted into a firm crust. Allow the muffins to cool for at least 10-15 minutes before removing them from the pan. hi there, i would REALLY love to make this, but i don’t have a popover pan and do not feel like buying one just for this recipe. anything else i can make this in? Thank you so much for all of your hard work & explanations! Visiting from San Diego, we were referred to Craftsman & Wolves this past weekend for the Rebel Within! I was determined to find a recipe, so we could have warm vs cold. I knew it wouldn’t be easy & had no idea how to make the egg runny while cooking the muffin! You exceeded my expectations & saved my patience too! Thank you again. @Cori – I didn’t notice a grayish ring when I was testing the recipe but I’ll keep an eye out the next time. Was the gray on the muffin part or the outside of the egg? @susanna – The cavities in the large popover pan are 2.75″ wide by 2.25″ high so you could try using ceramic mugs like @CatherineW did (brilliant!) or tall straight sided paper muffin cups. If you use mugs, I recommend lining the inside with parchment paper so that the muffin can be more easily removed (i.e. small circle, and then a tall strip for the sides). OMG! I cannot wait to try to make this recipe. I just walked from the center of San Francisco to Craftsman & Wolves to specifically try “Rebel Within”. It was fantastic with only one exception. They only serve cold, & cannot even warm on request because it will “ruin the integrity” of the muffin/egg. I thought flavors were fantastic so I completely ate mine, while my husband could not get past the cold. To bad for him. Thank you for the opportunity, due to your efforts, to try on my own. I tried this muffin Saturday and they offered to warm it up for me. It didn’t seem compromised in any way. There is a pretty fool-proof method to get perfect, tender, soft-boiled eggs that uses much less water and eliminates the risk of cracked shells. Basically put 1/2-inch of water in a small pot, bring to a simmer, add as many eggs as you need in a single layer, so eggs are only partially submerged in the water. Cover the pot and cook for exactly 6 minutes. This method cooks the eggs very gently. The shells don’t crack while cooking. Remove eggs from the hot water, cool them a bit in cold/ice water and peel. Whites are extremely tender and yolks are very runny. It seems that this state of coked egg would be great for this muffin recipe. This soft-boiled egg technique has been discussed at the Cool’s Illustrated website. I think they use farm raised duck eggs vs chicken eggs. Duck eggs are creamier and richer than chicken eggs. Try them next time you whip up a batch of these muffins. I would question whether they used traditional soft boiled eggs – I’d think the peeling would be too slow and too labour intensive. I’d suggest experimenting with lightly poaching the eggs, popping them in moulds overnight in the fridge, and faking it. Basicly, put each poached egg in a piece of cling film or a small bag, gently twist the edges together, tie (think boiled in the bag pudding) and hang suspended to get a round egg. With the right sort of bag or silicone mould, you could even poach in the bag. Chilling will set the just cooked white in the sphere shape. Awesomely thorough post! You have inspired me to follow through with the recipe. What temperature did you bake the muffins at??? What an amazing amount of work! Recipe looks fantastic. I have made peeled soft boiled eggs before – Joy of Cooking called it Eggs Moules and loved those- plus they peeled great in the 80’s with supermarket eggs. Have had extreme issues peeling eggs lately – no matter what age – perhaps it is because they are free range, organic, or farm . . . but appreciate your tips.not to mention that they can be made ahead! Can’t wait to try the muffins with the egg inside. Yum. I just made these, but I used diced ham instead of bacon. Turned out so awesome and delicious! i had a lot of left over batter, so I made a giant savory pancake while the muffins baked. the pancake was also really good. Thank you, Thank you! Now I’m so happy. many thanks for your detailed notes and dedication. I can’t wait to try this. I originally thought I was going to try different temperatures and times to cook the eggs, but am so glad you have saved me the effort. This recipe looks INCREDIBLY scrumptious! I don’t see anywhere to print the last (final) masterpiece???…. The Craftsman & Wolves chef just said the 1st cheese in the batter was Asiago & the 2nd cheese was Parmesan. Their housemade sausage is made of fatback & pork shoulder. The chef also rolled the boiled eggs in flour prior to setting them off in batter lined tins. He said the reason to do this is to keep the naturally wet exterior of the egg white to keep from separating from the muffin batter. The flour will cause a sort of sticky membrane to adhere to the batter during baking. He used what appeared to be a 24 well (6 x 4) popover pan. ONLY filling the middle 2 rows and alternating those 2 rows so that only a total of 6 muffins were being baked out of 24 in any one pan. during I don’t know how accurate it is given they probably don’t want their secret to be out. This was awesome! I made them and they were delicious. I soft boiled the eggs for 4 minutes and the first finished product we cut had runny yolk but the second one didn’t. Thank you so much for doing all the work because it saved me the trouble. Any chance you’d be willing to take on Mr. Holmes Bakehouse cruffin? I would really appreciate that! Burma Superstar is a hole in the wall serving traditional and excellent Burmese food. It’s most famous for the green tea leaf salad featured on Food Network. It was one of my foodie highlights in San Francisco and a must try.